Welcome to Travel Guide 2 Bahamas, the site about travel, tourism and vacations in the Bahamas. The Commonwealth of the Bahamas is an English-speaking nation, located on an archipelago of 2,700 islands and cays (cays are low-lying islands formed from and coral). The Bahamas lies in the Atlantic Ocean, just of the Southeast tip of Florida, to the North of Cuba. The Bahamas also border the Turks and Caicos Islands which lie to the Southeast. The estimated population of the islands is around 323,000. 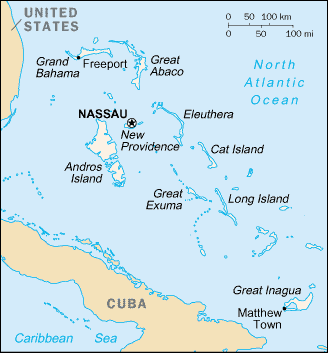 About two thirds of this population lives on the New Providence Island which is the location of Nassau, the islands' capital and largest city. About half of the remaining population (i.e., around 50,000 people) lives on Grand Bahama, which is the location of the second largest city Freeport. None of the remaining cities in the Commonwealth has a population of over 10,000, the largest of them are Andros Town, Arthur's Town, Clarence Town, Coopers Town, Dunmore Town, Freetown, High Rock and Marsh Harbour. Economically, the Bahamas are classified as an upper-middle income developing country. Around 60% of the country's GDP is generated by the tourism industry (the islands receive 5 million tourist visitors each year, mostly from the United States), and the industry employs approximately half of the Bahamian workforce. Financial services are the second most important part of the Bahamian economy and account for around 15% of the nation's GDP. The government has also tried to encourage the growth of agriculture and manufacturing, but despite government incentives there has been little growth in these areas, and today the government is focusing on developing e-commerce as the "third pillar" of the economy. The currency of the Bahamas is the Bahamian dollar. The Bahamas government maintains the Bahamian dollar's exchange-rate at parity with the US dollar. As a result, businesses in the islands accept both US and Bahamian dollars, and even keep US dollars available for giving change to American tourists. As already mentioned, tourism is the main industry in the islands, so as you might expect there are many reasons to visit the Bahamas. Of course, many people visit for the beautiful beaches - but there is a lot more to do as well! There is a wide choice of water sports available, sailing and boating is popular, and you can see many beautiful marine creatures if you go SCUBA diving or snorkeling. Other popular activities include sport fishing, tennis, and of course, golf.